Colonel Lee Retires From the Army and Joins AMAZON.COM! 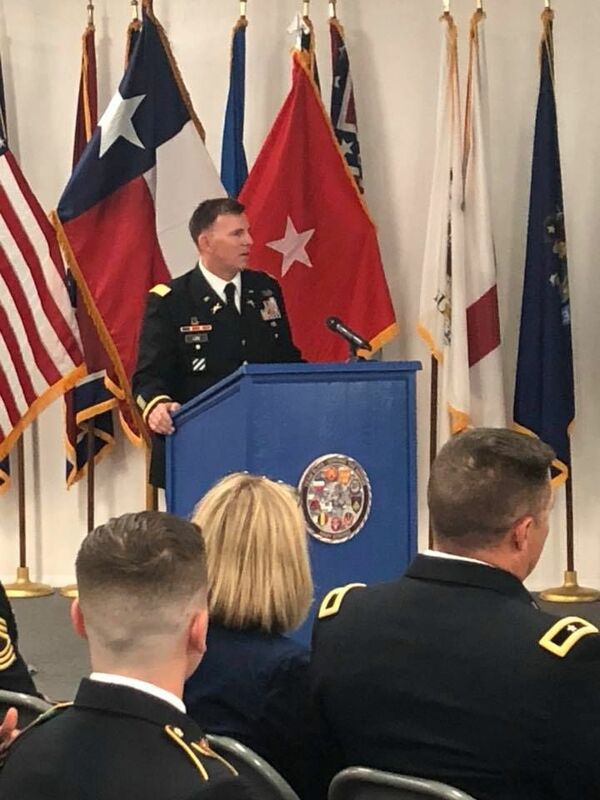 After 25 years and 8 months of active duty with the US Army, our FASF Trustee, James K. “Jimmy” Lee, has retired from the service. 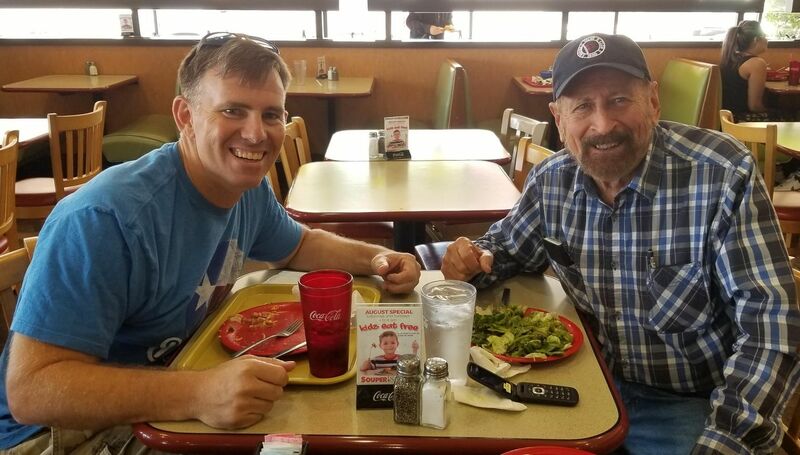 L to R: Jimmy Lee and Ric Lambart at lunch in El Paso Texas yesterday. While initially serving on our Board, this native North Carolinian was the Commanding Officer of the University of Texas, El Paso’s (UTEP) Army Reserve Officers’ Training Corps (AROTC) Battalion, known as the Fighting Miners (see below photos). To see his more complete and varied background, check out Jimmy’s Biography right here (scroll down the page). Jimmy Adresses his UTEP graduating class of new U.S. Army 2nd Lieutenatnts this Spring. Just prior to retiring, the Colonel looked at various civilian work opportunities, and was given the most attractive offer by the International Marketing firm, AMAZON.COM. 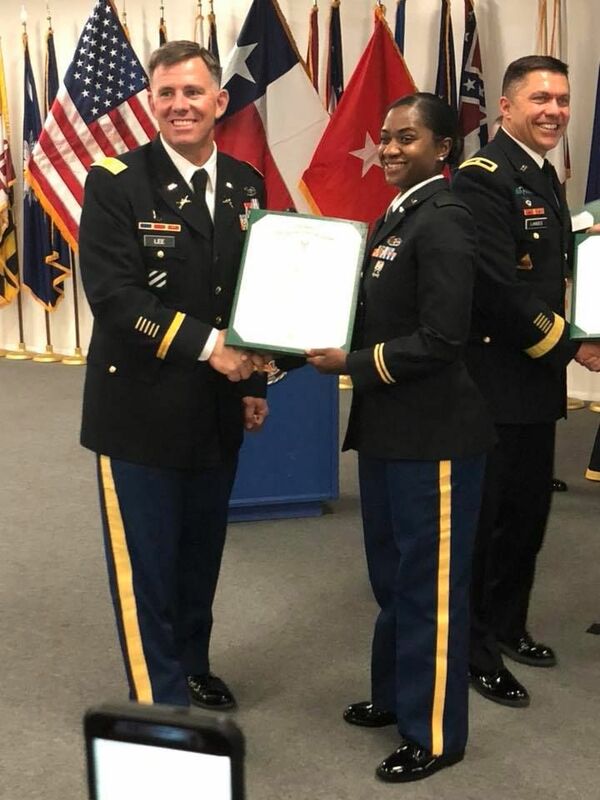 Jimmy congratulates one of his new 2nd Lieutenants, Demeatia Jasper, during the UTEP Graduation ceremony. In his new job as Operation’s Manager, Jimmy supervises some 54 employees and is responsible for efficiently managing one of AMAZON’S major “Fullfillment Centers,” which is what AMAZON calls its major shipping facilities throughout the world. In his personal life, Jimmy has been an enthusiastic parachutist, which means that on any given weekend you are likely to find him at one of the nearest airports busily jumping – and then busily repacking his parachutes. He has 96 civilian sport parachute jumps to his credit, excluding 5 while in the Army – so he’s had over 100 jumps altogether. The Lees have two young sons; one, now 20, is already away at College and the younger, 17, is in his last year of High School. Both young men share their Dad’s enthusiasm for both sports and the military, so intend to follow his example in their own upcoming careers. Earlier this year, Colonel Lee made a special presentation to a group of former military aviators, all also active members of the FASF, the Daedalians, at the local El Paso Club. We wish Jimmy the best in his new endeavor – – – and are happy to learn that he has every intention of remaining active and of helping us with his leadership skills, as a Trustee with the FASF, as it moves into the future! This entry was posted in HOT NEWS! and tagged 2nd Lieutenants, 2nd Lt. Demeatia Jasper, AMAZON.COM, Biography, Colonel Jimmy Lee, Daedalians, El Pazso Club, Fighting Miners, Fullfillment Center, international marketing corporation, Jumps, Leadership, Masters Degrees, Naval War College, NMSU, Operations Manager, Parachutist, Retirement, Ric Lambart, Training., Trustee, UTEP on August 15, 2018 by FASFRIC.